The internet and other forms of social media have built bridges all over the world. Technology has spread to even the most remote parts of the world, which allows people to connect and experience things they otherwise would not have had the chance to do. The downside to this bridging is that it opens up your home to criminals from all over the world. Your home is supposed to be your safe haven from the world outside but the internet has changed all of that. Teens are often the target of a multitude of scams because they strive for independence but lack the wisdom to make safe and responsible decisions. As parents, we want to watch over their shoulder as much as possible but it just isn't practical. We want to trust our kids and give them a little latitude to make decisions but at the same time, we worry. A key logger is a great way to keep an eye on them without them even knowing that you're watching. You can monitor everything they do on the computer and they feel as though they have established some independence. Even if they try to avoid your prying eyes, you can utilize a capture password device that will let you see what they really don't want you to see.You can even monitor their whereabouts when they are away from home with a teen driving tracking device installed in your car. You can know in an instant exactly where to find your kid. This is a big help to law enforcement personnel in the event you ever need to call on them for assistance. The world is a big place, especially for a teen. Help them out a bit and get some peace of mind at the same time. I recycled Ms. Burrito's used TinkerBel socks instead of throwing it. I used it to cover the disinfectant wipes and the wood polish cleaner. Ms. Burrito said "Awe, that is cute MOm!" TinkerBel's hair matches the lids of the containers hehehe. What do you think? We saw this display at Carnegie Science Center honoring Charles Robert Darwin, a scientist who is responsible for establishing the fundamental principles that underlie modern biology and bitechnology. There is an interactive screen that you can touch and ask questions and it will give you answer. It's pretty cool. During my recent visit to my dentist for my annual prophylaxis, I told her that the my partial is bothering me. It is rubbing onto the tooth and it is painful sometimes. I asked her if she could do something to adjust it and she she did. As a result, that particular tooth developed a cavity. She also told me to use a pronamel toothpaste instead of the one that I was using. After she adjusted the partial, it is not bothering my tooth anymore, it's not hard to remove it, and I think that my cavity is slowly going away. I also have to use an extra soft toothbrush. I cleaned up our backyard this morning after I went for my morning run. I removed all the dead twigs from my plants so the new plant can breath. We have a really nice weather this morning but the wind has picked up in the afternoon so we are kind of stuck inside the house again. I wish that we could afford to have a playground for our kids at our own yard. 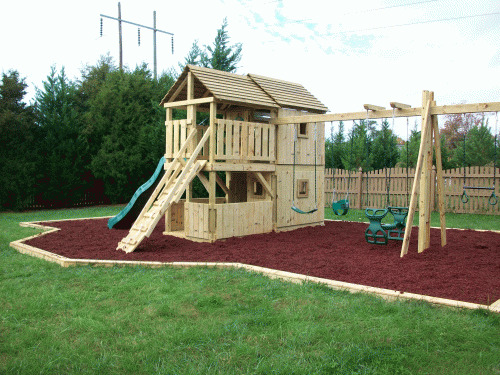 I was looking for wood swing sets in richmond va a while ago and my kids would truly like it if we have it in our backyard.